Our Long Lac property lies just 50 kilometers east of the town of Geraldton, Ontario and 30 kilometres from the town of Long Lac itself. One of the main gold mining camps in Ontario, the Beardman-Geraldton gold camp, has more than 8 million ounces of gold production and resources, and is assumed to extend through the Longlac property. Melkior owns 100% interest in the property. The property is divided into two main areas, named LL1 and LL3, which are accessible year-round and supported by nearby excellent infrastructure. Through airborne magnetic and electromagnetic surveys as well as several prospecting and mapping campaigns, we have located and outlined three good structural zones of interest that have shown strong, shallow-lying gold anomalies. Current exploration indicates a strong potential for mineral discovery. The property is located in the eastern part of the LongLac-Geraldton-Beardmore Greenstone/metasedimentary belt, the host of one of the main gold mining camps in Ontario. Only limited exploration has been conducted in the past due to previous glacial cover. In 2008, Melkior commissioned an airborne magnetic and electromagnetic survey, covering both properties. In 2008 and 2009, mapping and prospecting campaigns were undertaken through which two main areas of interest were identified on the LL1 property. The first area, followed for 20 meters, returned gold values of 3.43 g/t and 2.37 g/t. The gold is hosted in a silicified amphibolite and is associated with high values of arsenic. The second area returned values of 1.47 g/t; 1.15 g/t gold and 4.09 g/t silver in a gold bearing iron formation injected with quartz veins. In 2010, an Induced Polarity (IP) survey was successful in locating and outlining three good structural zones on the LL3 property, and assisted in identifying three strong east-west striking magnetic units on the LL1 property. 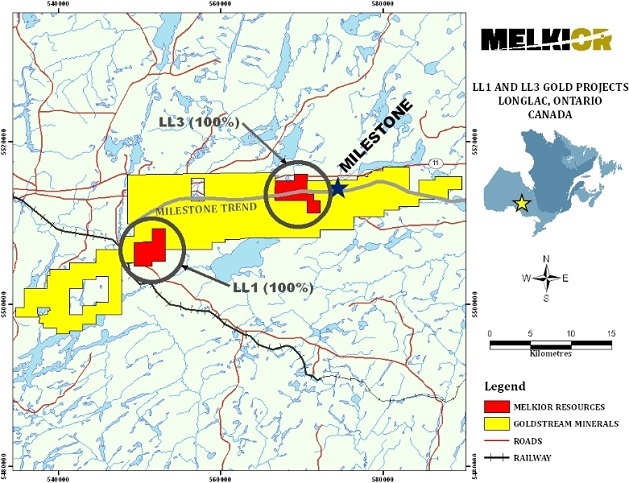 In the fall of 2012, a program of geochemical and soil gas hydrocarbon surveying was undertaken, which identified two strong gold anomalies on the LL1 property. The B-horizon survey detected low level gold and arsenic anomalies on both the LL1 and LL3 properties. In an adjacent property owned by Goldstream, a low-grade, high tonnage deposit near the surface received its 43-101 compliant resource calculation, demonstrating the potential discovery in this property.